There will be several fireworks shows in the Portland area on Wednesday, July 4th 2012. All of the shows listed below can be seen from the sponsoring event venues and surrounding areas – find a roof or a hill for the best viewing! 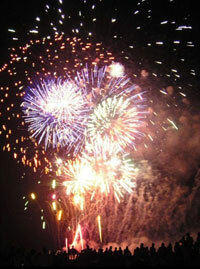 One of the largest fireworks displays west of the Mississippi River, Fort Vancouver’s show starts at 10:05 p.m. The display can be seen from miles around, but is best seen from the north side of the Columbia. The fireworks show is the climax to a day of festivities at the fort – visit the website for more information, including ticket prices and entertainment schedules. This show, which kicks off at 10 p.m. at Tom McCall Waterfront Park, is the largest fireworks show in Oregon. Viewable from anyplace around town that has a nice view of downtown. Of course if you’re attending the blues festival, you’ll have a great view. The Corbett Fun Festival features an annual parade, live music, and of course: Fireworks – around dusk. It’s the largest fireworks display in East County! Fireworks photo by Wikipedia contributor Exec8, used here under Creative Commons Attribution-ShareAlike 3.0 License. @Mike – this is amazing. I may have to feature this video on my blog on the 4th of July! Are there no fireworks on the June 30-July 1 weekend? People have to wait until the 4th? Is the one in Banks going to happen this year? This blog tells me that yes, there will be fireworks in Banks on the 4th this year: http://blog.visitwashingtoncountyoregon.com/ after the Firecracker 100 race. I heard about one in Oak Hill area; near Sunset High School but can’t find anything online about it. Has anyone found anything on this location? Also wondering about the Banks one—is there anything more there than the fireworks show–kids festivities earlier? are there fireworks planned for clackamette park this year? When: Monday, July 4 beginning at 5. Fireworks at 10. HOW LONG DO FIREWORK ‘SHOWS’ LAST? I get off work at 11 and am hoping to watch the Waterfront fireworks. Let me know, please! The shows don’t generally last more than 30 minutes . . . but there will still be lots of neighborhood fireworks going off later.